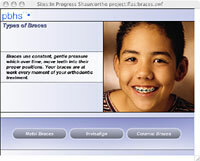 Braces use constant, gentle pressure, applied to your teeth over time, to move them into proper position. Your braces are at work every moment of your orthodontic treatment. While braces are available in a variety of styles, including metal, clear and ceramic, they all have the same goal: To correctly align your teeth and jaws for enhanced aesthetic appeal and for better oral health. Also called “self-ligating”, these braces do not require elastics or ties, but instead use free-sliding technology to reduce pressure, friction, and treatment time for the patient. Begin the road to enhancing your smile today, call us to find out about the many orthodontic options that we offer!